A blog on knitting and any other thoughts I feel compelled to share with blogland. Dancing competition. Chose this pic because you can see a bit of dancing, natch, plus the setup with the judges' tent. It wasn't a traditional ladylike dance, there was a lot of stamping and fist clenching - I think it represented a battle or a trade or something. it's an irish jig. one of the "national" dances. i used to highland dance competitively when i was younger. going to competitions was such fun. 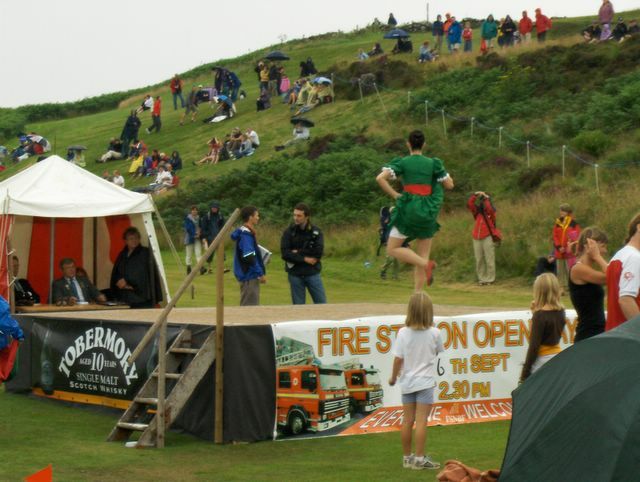 my sister and i went to highland games here (in B.C.) just a couple of weekends ago. it was great to experience it all again. Thanks Shelley. The girls were all extremely fit and the four girls who danced this jig were great- I couldn't tell their performances apart, but the judges managed to place them. Okay, you asked for it! Martyrs Bay, Iona. Lovely weather that day.